It’s easy to figure out why there’s a National Packard Museum in Warren, Ohio. The Packard brothers started out in Warren in 1899. Within a decade the company, known for its high-quality cars, was based in Detroit and neither Packard sibling was associated with it. But their legacy lives on in their hometown in northeast Ohio. The 1953 Henney-Packard Ambulance (shown below) served at Tinker Air Force Base in Oklahoma. Inside there was a large medicine cabinet, lifesaving equipment and seats that converted to beds. They saw service globally by the U.S. military. There’s an extensive collection of archives from the Packard family and the Packard Electric Company (which still exists as part of Delphi Automotive), memorabilia, and a handful of Packard marine engines. Check their schedule for annual events that include a Packard legacy weekend (devoted to the car whose motto was “Ask the man who owns one”) and a motorcycle show. Number of vehicles: 30, plus special exhibits throughout the year. 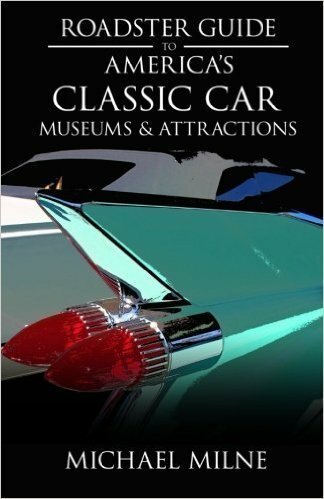 Highlights: 1900 Packard Model B (the second-oldest surviving Packard); 1911 Model 30 Detroit Fire Department Squad Car; 1927 Sterling Knight (the last car made in Warren, by a short-lived venture); 1956 Packard Caribbean Push-Button Automatic Convertible. Location: 1899 Mahoning Avenue N.W., Warren, OH 44483. About 60 miles southeast of Cleveland. Hours: Tuesday through Saturday, noon to 5 p.m.; Sunday, 1 to 5 p.m. If you’re visiting Warren, there are a few attractions that may interest you. In addition to classic cars, the small town offers several sights related to a few of our key interests: space exploration and rock-and-roll. Neil Armstrong went on his first airplane ride in Warren when he was only six years old. Bitten by the aviation bug, just thirty-three years later he was kicking up lunar dust as the first man on the moon. The airfield from which he took off in a Ford Tri-Motor is long gone; to paraphrase Joni Mitchell, “they paved paradise and put up a McDonald’s parking lot.” But in a corner of the lot “First Flight” park commemorates the historical site with a replica lunar module occupying pride-of-place in the center. Warren must have something for commemorations with a fast-food connection. Drive just three miles southeast from the lunar landscape to a Burger King at David Grohl Alley. It’s hard to miss since it’s decorated with the world’s largest pair of drumsticks (they’re each 23 feet long) that are set up like a teeter-totter. Rock and Roll Hall of Fame member Grohl was the drummer for Nirvana and is now the frontman for the Foo Fighters. The town where he got his start remembers him with this small street that is decorated with dozens of rock-themed murals in addition to the jumbo drumsticks.